Great write up doc! Very well put together and covers just about any question a new reloader would come across, even gives some of the more experienced reloaders some good info. BTW, your runout is low, most factory "match grade" ammo I have checked shows between .002-.003 runnout on average. Thanks, I'll see what I can do to get my runout "Up To" factory match specs. doc, Thank you for taking your time to help others. Very Well Done Sailor! Thanks for taking the time to pull this together. Guys, this tutorial is very informative. I will have to give the Possum Hollow Trimmer a ++++++++++1. Very Fast, accurate, and affordable for trimming cases! Doc, outstanding job. Very helpful and not confusing to a beginner to reloading.It is indeed very hard to explain in writing what a lot of us do as second nature now. Thanx again for all the help Doc. Made my decisions a lot easier. Doc, that really brings things into focus. Thanks for sharing. I'm interested in the Possum Hollow case trimmer, do you have any further tips on its use, or pictures? Is it hard to hold on the cases while the trimmer is on a drill? I guess a "vice grip" and steady hand will produce less vibrations and better results. Lastly, where can I get one at a good price? The only place to get one that I have found is Sinclair's for about $19.00. The power holder that you need is another $12.00 but it also holds standard deburring tools so it's not a waste even if you don't like the P.H. .
As for holding on to the case. Never had an issue holding it in my hands to achieve the desired results. It doesn't take much pressure. You can push as hard as you want, it's still going to trim if you push lightly, all you'll get is a shiny ring on the shoulder by pushing hard. The vibrations let you know when it's done so they are a good thing in this instance. When it quit's vibrating, it's done. Oh, it's also adjustable for length via an allen head screw and you can push the cutter up and down as desired and reset if need be. Doc, thanks for taking the time to put this together and sharing what you've learned. Still haven't broke myself of the cordless drill habit, but gearing up to try the drill press soon. I'll give the PH trimmer a try, I want one that does not run a pilot inside the case neck. Nice work! Comforting to know I've been taught well!!! Thanks for the write up! I think I am going to take the reloading plunge soon. That took some serious effort, awesome review! I went and looked at the Lee presses yesterday. 10ring.com(Local store) has both the Classic single stage and The Classic Turret which if you remove the rotator shaft acts as single stage. I like the Idea of not having to remove my Dies from the turret but noticed it had a little wiggle room in the top of the press. prolly best to just go with single stage? Only $78.00 vs $89.00 for classic turret. I will be the LAST person on this rock to tell you that good ammo cannot be made on a Lee Turret Press. That being said I have removed mine to making pistol and rattle battle ammo simply for the reason you stated. Now as for hot swapping dies, check that classic cast SS press again. 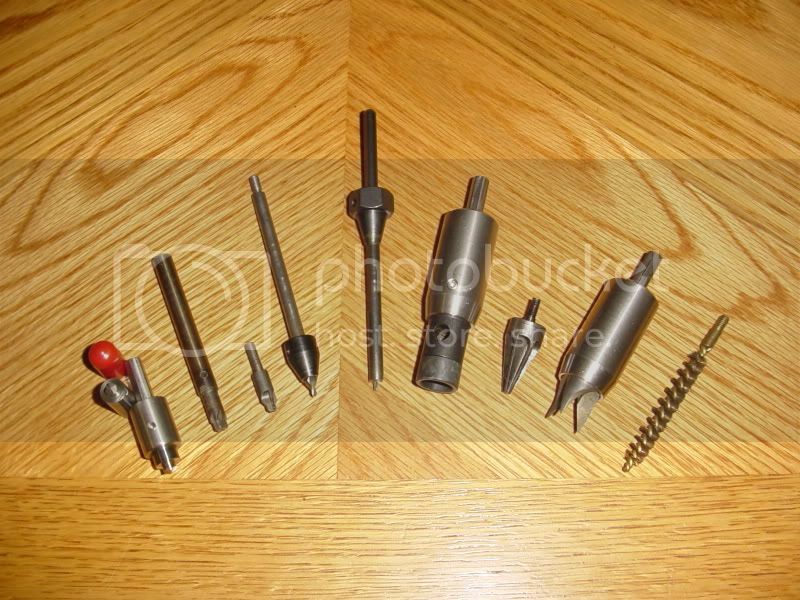 You will see there is an insert that allows the use of the 7/8 X 14 TPI dies (regular size). If you unscrew the insert and screw in the Hornady Lock -n-Load bushing you will have hot swappable dies with negligable wobble. I think that system costs $14.00 with three bushings, not a bad investment considering you only need 2 dies. Excellent post. I took his advise before this was posted on here and it has worked great. 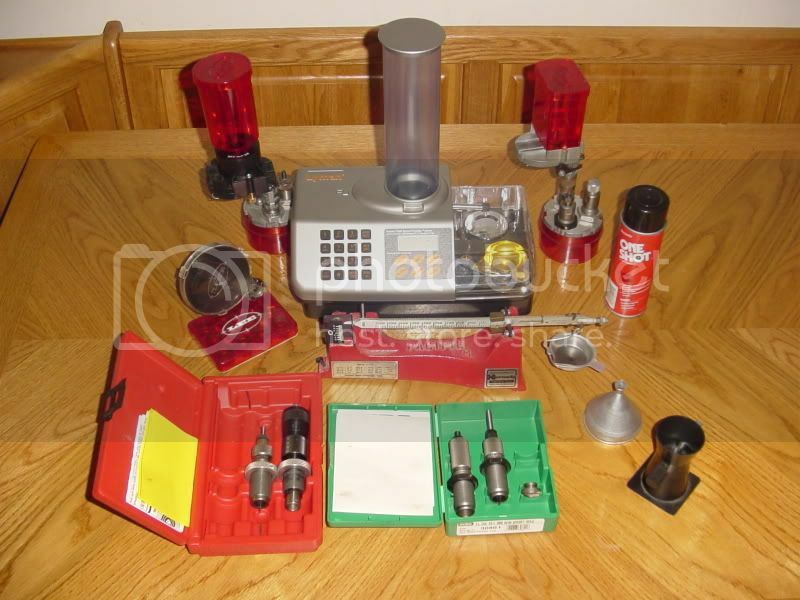 I already had the Rockchucker master reloading kit for a few years but had never used it. I asked a few questions on the board and the instructions given here and have finaly started loading. So far I just got my bench set up but I cant wait to start loading and then shooting. Excellent write-up. I can't emphasize enough how educated I was by reading a couple reloading manuals a month before purchasing what I wanted. I tried going with a best of breed setup and was looking more to do it right (slow single stage) rather than speed (progressive). One thing that I would add is most reloading kits don't offer calipers...A move I never have understood. Hey Doc, Good Info I have been reloading a long time, this is a good update. Thanks for the info. I hand load ~60 different cartridges. Most of my gear, I don't use anymore. 16) Any Chinese pin gauge sets .060 to .500"
I think the Hornady Lock-n-load Doc is looking at would be a great way to keep the dies set up and ready for a quick-change. If I didn't already have a Redding T-7 turret press, I would have all my dies in L-N-L bushings. Thanks for the post as I was about to post the question about reloading. However after reading this (which was extremely useful) I didn't see you mentioning much about presses. My question is, are there major differences with the progressive presses as opposed to single stage press. I gather from what I have read so far the single stage are better for accuracy than the progressive but is there much difference in accuracy. As I shoot from anywhere 100 -800m and generally use FGMM 175 due to there accuracy and would not like to compromise the accurancy to start with by buying the wrong type of press. I must say I do like the idea of progressive presses due to quantity of ammo you can produce in a short time frame. But if the ammo is poor in accurancy then its no good to me. Any thoughts on the brand and type of presses would be appreciated. IMHO you will ALWAYS have a need for a SS press, simply because of the setup costs and parts needed to make a progressive run with a new cartridge. If you are new to reloading your concentration should be on what is happening in one place at one time. If all the steps are happening at the same time it can be very difficult to determine where the errors are occuring. Can you make good ammo on a progressive press. You betcha!! but those that do it have been making ammo for a long time and they have it down. LTRdavid is the resident authority on progressive presses and I will defer to him for the specifics. Dillon seems to be the go to press for progressives. The biggest limiting factor on a progressive is the consistency of the powder throw. If you are going to weigh each charge for max accuracy you might as well run a SS, but that's my opinion. That is a great write up. It also answered a few question I had, and also raised one I didn't know about. How much do you chamfer the outside of the flash hole? Would I set the chamfer to match the inside? I use two different tools to do the flash holes. The inside one is indexed off the web of the case and is consistant no matter what type of case you use (some are thicker than others at the web). The outside one has a stop collar that was supposed to be used for the case mouth. I set it to index off the primer pocket shoulder which if you uniformed the pocket first will give you a consistant chamfer. Depth wise on the outside chamfer, do you just break the edge of the flash hole or match the inside flash hole deburring depth? My inside deburring tool measures .141, would I take this measurement then add the depth of the primer pocket to set the stop collar. Or am I overthinking this. I didn't get that deep. I cut a chamfer that looked "right" and then set the stop. Not much science more of a feel. I just wanted to get the "mouth" opened up a bit to feed in more fire. Looked for a good pic but to no avail. Actually you answered my question, too little is better than too much. I'll probably do a 1/3 to a 1/2 of what the internal flash hole is, mainly so I can write it down and double check every so often that the stop hasn't moved. It will also make all the cases consistant. Thanks again for the great article, you answered a lot of my questions that I had. I've been reloading for a couple of years now, and thought I was doing pretty well...This forum has improved my technique and equipment vastly...not to mention saved me money. 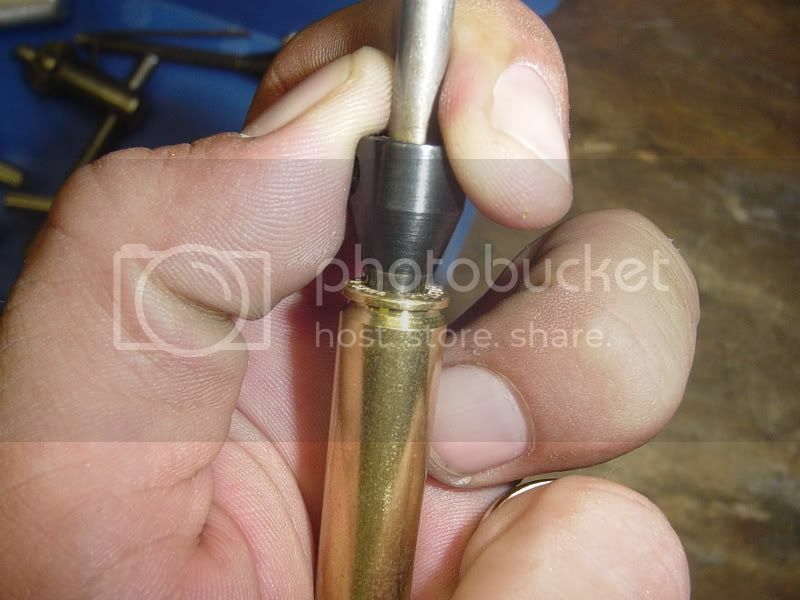 Doc, can you put a picture up of the "time saver" you had machined as a quick check of the brass length? Thanks for the great info. 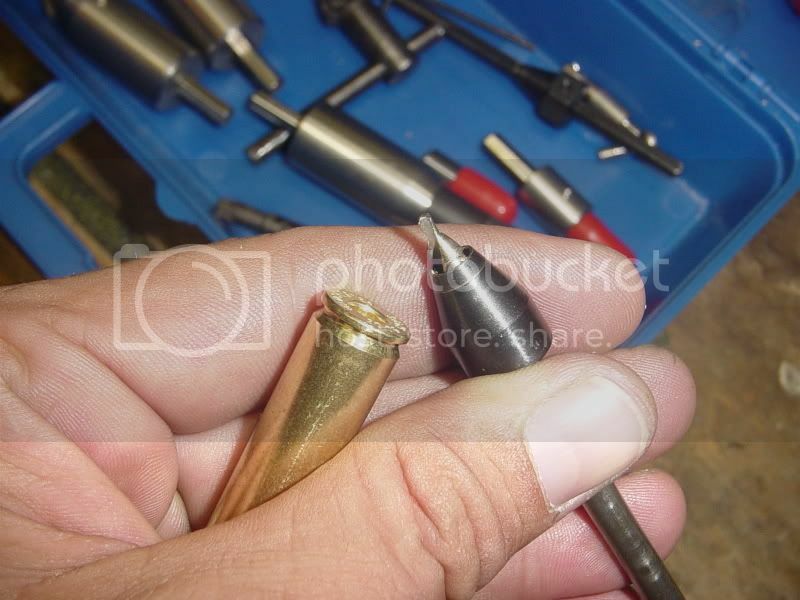 Doc, does anything need to be done to unfired Lapua brass before loading? Wow! Great write up! Answered 90% of the "dumb" questions I was about to ask everyone in the otehr forum. Glad I found your write up! Thank you very much for the write up, now that I am reloading for myself I have taking alot of your ways and it has improved my knowledge in reloading and most important has improved the consistency on my loads. Once again THANK YOU for helping out a first timer! doc....you rock. Outstanding job. I also like the Forster Ultra FL reloading dies. I find them very easy to use. I'm in the process of replacing all my RCBS caliber dies with Forster Ultra FL dies. Well done Sir! I have several reloading manuals that are not nearly as succinct. Are there a few manuals I could get recommended? Bear in mind I am really really green and know not much about guns in general let alone reloading. And would have a checklist of everything I basically need? I have about 5 manuals and this is by far the best. It covers most all mfgs. bullets. 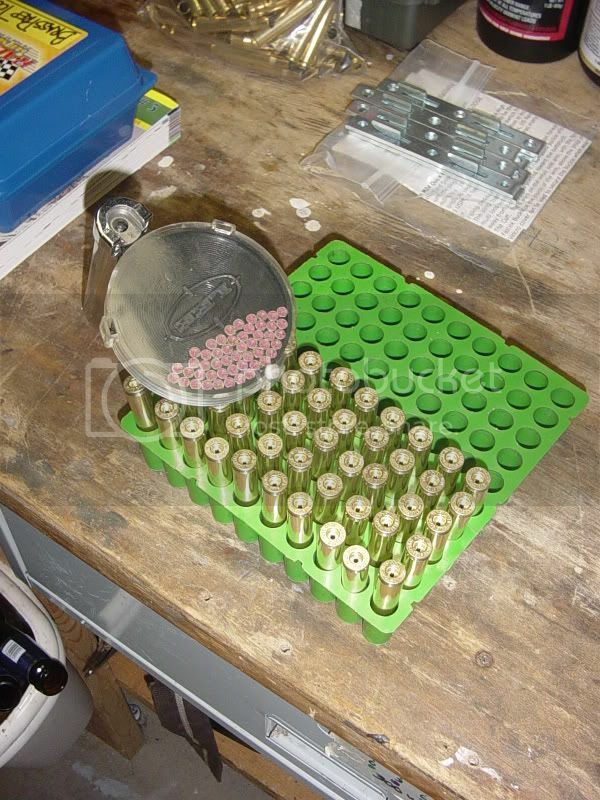 Read the stuff about handloading, not just the data. Hope this helps. I have been reading this just about every other day for about a month now. Just about got all the tools in now except for the Possum Hollow Case trimmer (on backorder) for the brass prep. Time to say thanks to Doc for a great post. Really makes it easy to understand and now I will be making better ammo. Well I have read your thread over and over at least 10 times. I am very grateful for your time and thorough article. I purchased 80% of the stuff you listed and just sat down tonight for my very first reloading session. Between this and the two reloading manuals I picked up - it went without a hitch. I only was able to complete 10 rounds from start to finish (reworking once fired brass - to checking OAL and throat length in my rifle and adjusting the micro seater accordingly) in 2.5 hours. But in my defense I was reading, checking, rechecking, and remeasuring most of the time. I hope to get out and put the 10 rounds on paper to see how they stack up to the standard BH ammo I have been throwing down range. I also sucked it up and purchased a Chargemaster combo - man is that thing cool. I couldn't wait to get the brass cleaned, trimmed, and primed so I could finally play with it. Thanks again!